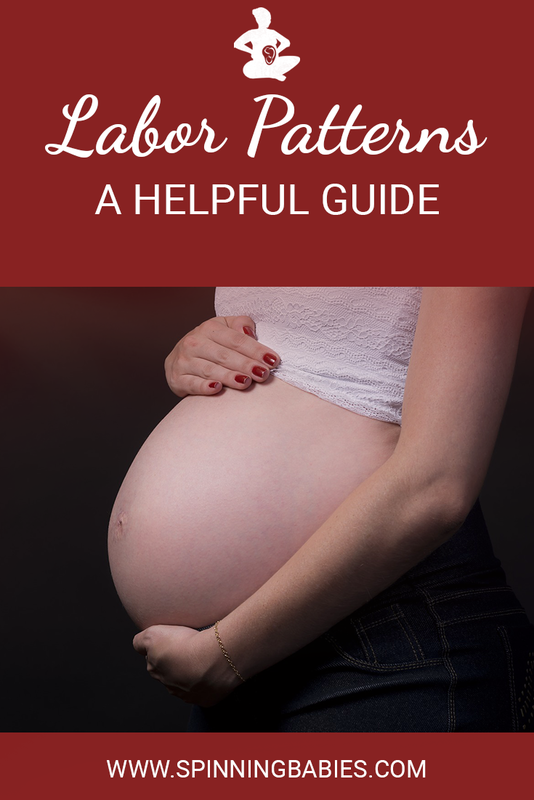 This is the labor pattern in which the contractions come at fairly regular intervals (i.e. every 3-4 minutes with a little variation, and then every 2-3 as the cervix opens more than 7 cm). Contractions may come in double peaks, a big one with a lingering second peak, like a hiker pulling a dog on a leash. And sometimes a cluster of big contractions may come and then some not so strong ones follow until the next big trio of waves return. These are contraction variations that tell us the uterus is working to fit the baby through the pelvis. The contractions are pretty steady, but the cervix opens slowly due to a close fit between the mom and baby. Labor can be long without the cause being the baby’s fit. For instance, did the woman have a pinch of her cervix removed in her past for testing? The scar tissue that resulted from this test could prevent the cervix from opening until the contractions have been super strong for hours. Then suddenly the cervix opens and can actually open from 2 cm to 10 cm in 15 to 60 minutes. That event has nothing to do with fetal position. I mention it to remind us all, it’s not always about fetal position. Sometimes the uterus gets tired and stalls. The contractions are less painful and the mother can sleep. Sometimes this happens after the uterus has accomplished a goal, such as fetal rotation or engagement. 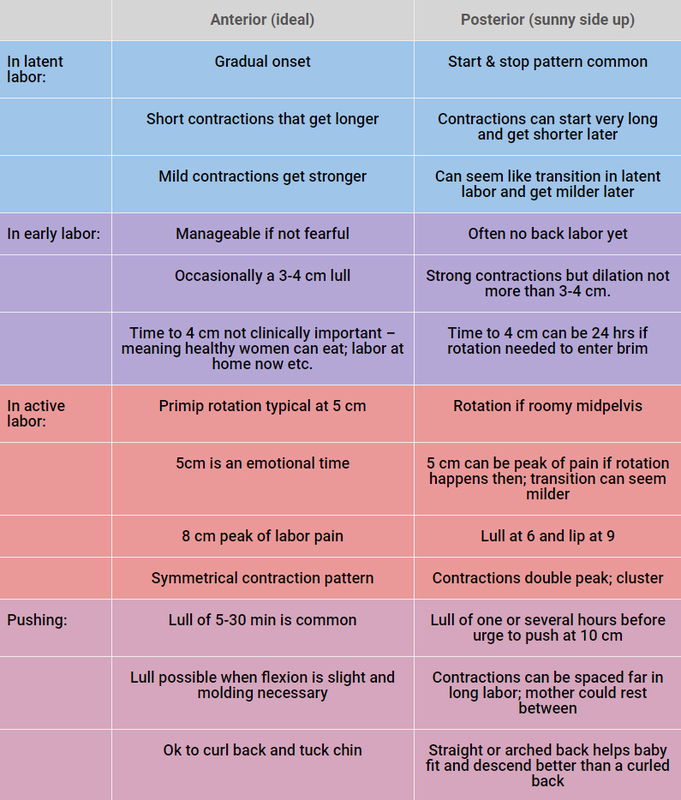 Fetal rotation is labor progress even when the cervix hasn’t changed or hasn’t changed much. 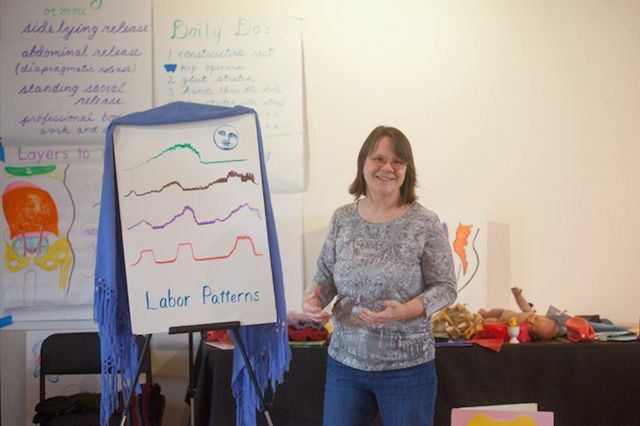 After the rest, the contractions will return with strength and the labor is very likely to advance faster and more like a “normal” labor, meaning, as it had been expected before the stall. Sometimes the uterus is working so hard, really trying to get the baby to rotate and descend. The mother gets no break. We want to see if labor is advancing by bringing the baby lower, even if so gradually that it takes a few vaginal exams to notice, that’s fine as long as mother and baby are fine. Compare that to the baby that can’t fit at all. The baby will be in the optimal, ideal or perfect position. Your efforts will have brought the baby to LOA and yet the baby remains high, wherever the pelvis was too small to let baby down. Can the pelvis be opened enough to let baby through? If yes, you will have progress. If no, then, thank God there is the cesarean. It’s telling the true difference that requires experience. Is the baby known to be posterior? When labor is long due to the baby coming INTO the pelvis in the posterior position, we want to know if the baby will continue to fit in the posterior position or be able to rotate. We don’t usually get to know this, so we can have an educated guess. If labor is moving along readily, we can assume it will continue to do so. If labor is slow, we can hope the baby fits. We can choose to be patient or we can try to rotate the baby. Spinning Babies is the active side of patience. Is labor long because baby is too big? Sometimes the baby gets stuck, actually, on the pelvis and can’t get past. This can be looked at as if the baby can’t fit, perhaps the doctor says the baby is too large. But if the baby is posterior, it isn’t likely that the baby is too large, but rather that the baby’s current head circumference is too large. There is a difference. Help the baby’s chin tuck to get a smaller head circumference. Rotate the baby so the head is coming down from a different angle. These are the three goals of the 3 Principles of Spinning Babies. Laboring woman has a pendulous uterus. Wearing a pregnancy belt, rebozo, or otherwise lifting and supporting the abdomen can bring the baby down with contractions! A need for doula CPR — Comfort, Praise, and Reassurance given honestly and appropriately. Cord wrapping. A cord wrapped around part of the baby may lengthen the labor. In time, the uterus will come down and allow the baby lower. Fetal heart rate decels that are Not the late decel type (the more dangerous type) can be heard or seen, if recording the heart rate on paper, occasionally in labor. Cord wrapping, even around the neck, is not usually life threatening. Your provider will watch carefully to tell if its safe to wait, which it usually is. Meanwhile, have patience and let your uterus do the pushing during 2nd stage. The baby may stay high for a long time and then suddenly descend through the pelvis quickly in a few contractions at the end of second stage. Trust that your baby knows what to do here. Most of the time wrapped cords are not detected until seen. Did the woman have a pinch of her cervix removed in her past for testing? The scar tissue that resulted from this test could prevent the cervix from opening until the contractions have been super strong for hours. Then suddenly the cervix opens and can actually open from 2 cm to 10 cm in 15 to 60 minutes. That event has nothing to do with fetal position. I mention it to remind us all, its not always about fetal position. A posterior labor is different than an anterior labor. The position of a “sunny-side up baby,” one facing the front, is called occiput posterior. A posterior baby fits less easily than the anterior baby. A posterior baby’s head seems bigger because of the angle it’s in when in the pelvis. When a baby starts labor with his or her back on mother’s right, or along the mother’s spine, labor may be longer, and sometimes may even need a doctor’s intervention to finish the birth with Pitocin IV, a vacuum and/or by cesarean. Other posterior babies come out with little fuss. A few babies don’t even need to rotate to come out. They might even come out in just a few hours of labor. We can’t panic just because the baby is posterior. Most posterior babies turn around, rotate, to the anterior during labor. You can do activities before and during labor that help the baby rotate sooner or more easily. These activities and techniques may even reduce the need for medical interventions. Not all, but most women will find benefits from applying this information. Remember to start with the 3 Principles. I wasn’t able to turn my posterior baby but all the effort using techniques from Spinning Babies helped to keep my labor progressing and I didn’t have back labor at all despite her position. You guys were a life saver! Bring Spinning Babies to your birth! Download Parent Class to a worthy device. Childbirth pain or cesarean surgery can be lessened. Enjoying birth can be possible now.